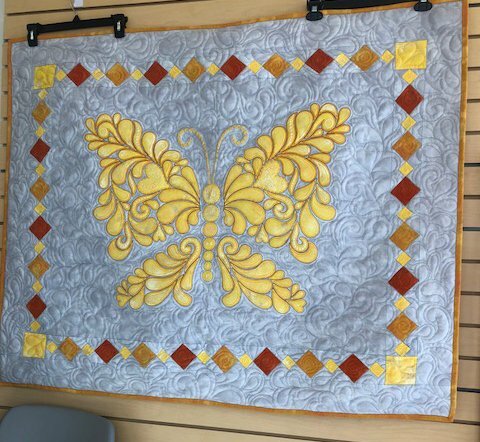 ​Create a unique wall hanging using Sarah Vedeler's Butterfly designs and the Accuquilt dies that go with it. We will use computer software to print templates of each part of the butterfly. We will use Sarah Vedeler's embroidery designs to appilque the designs to the background fabric. There will be three options in creating this wall hanging. Each option requires student to purchase "The Butterfly" from Morrow's and provide all the other supplies listed. Option #1: This option is for the student who does NOT have an Accuquilt Go Cutter and still wants to make the wall hanging. Call the store for details. Option #3: This option is for the student who does have an Accuquilt Go Cutter and has purchased the three dies (Heather Feather #1, Heather Feather #2 and Heather Feather Border) from Morrow's Sewing and Vacuum Center. Cost for the class: $45. 6. Color coordination between the butterfly, the background and the border.